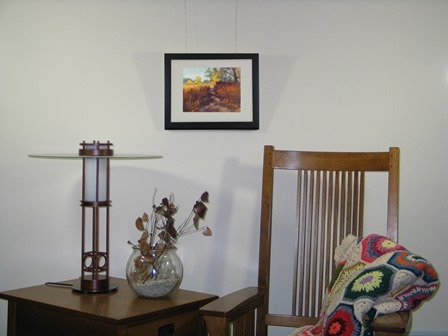 Original Oil Paintings by Artist Suzanne Poursine Massion - "Sumac Morning"
"The Staghorn Sumac has turned red and prairie grasses are yellow ocher. It's a fine October day and the weather is fair. 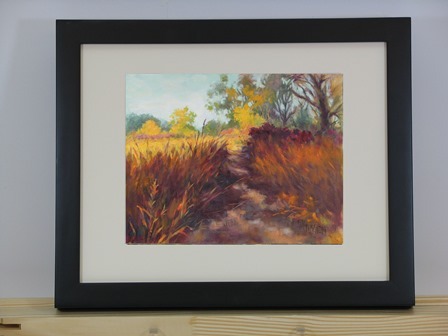 Purple shadows crawl across a narrow path that leads you to a sunny open prairie full of Tall Goldenrod." Shown in a possible frame. This painting is unframed but matted to an 11”H x 14”L size. It has a single 100% cotton rag mat with an acid free backing.